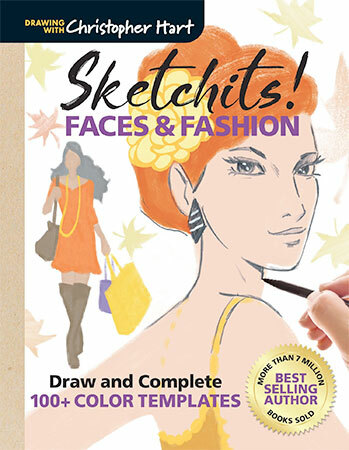 Introducing Sketchits!-a completely new concept from best-selling how-to-draw author Christopher Hart. This fun and whimsical approach to drawing starts with a colored impression-in this case a face or figure-and invites you to draw your own character using the impression as a guide. The basic colored impression is a loose guideline for a drawing, allowing you to fill in all of the fun details and draw characters that are entirely unique. It's a kind of "reverse coloring" approach-an extension of the coloring book craze that is accessible for anyone looking to challenge and express themselves. Focusing on faces and fashion, this edition of Sketchits! provides more than 100 colored blueprints for character creation. Have fun drawing faces, hair, patterned clothing, and accessories, with loads of different colored impressions to jump-start your creativity. With some drawing tips and techniques included, this is a great activity book for kids and adults alike, offering page after page of inspiration and drawing practice.